Need a healthy bread recipe? 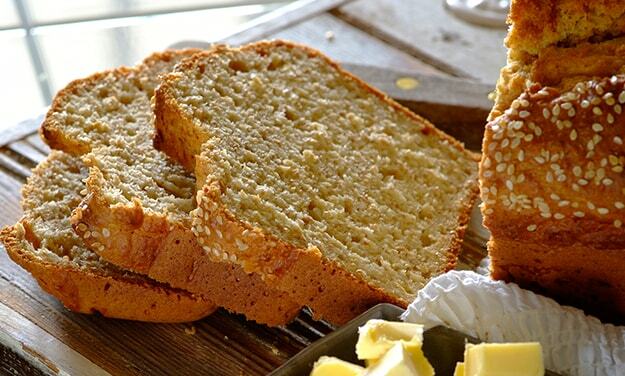 Try this wholewheat soda bread recipe for a delicious baked treat today. Stork – love to bake. Position rack in the centre of oven and preheat the oven to 200ÂºC. Grease a loaf tin well. In a large bowl mix the flours, salt and bicarb until well mixed. In another bowl, stir the egg, melted Stork Bake, honey and buttermilk together until well combined. Make a well in the centre of the dry ingredients and pour in the milk mixture. Mix well and add a little milk to make a soft and slightly sloppy mixture. Pour into a greased tin and sprinkle sunflower or sesame seeds on top if desired. Bake in the centre of the oven for 1 hour or until the bread is browned, crusty and sounds hollow when tapped on the bottom.